In highly successful companies the internal company values overlap with the values of the team members, resulting in a strong psychological contract being developed between the individual and the company. Shared values create greater engagement, dedication, and commitment, and these combine to produce better results. Shared values build trust; trust in the strategy, trust in the leadership and trust in the team. When the values of the company do not match the values of the team, you create a dysfunctional, distrustful, and ultimately destructive environment. A company’s cultural DNA is a social system that is enhanced and strengthened if new employees have similar overlapping values. With the Zappos 10 Core Values you know exactly where you stand in the company and as a potential new employee reading the list below you clearly understand whether you do or do not fit in with the company values, one of the pillars of cultural DNA. There is no doubt about the type of individual Zappos are trying to hire and the type of cultural DNA the company continues to build. Values are deeply held views of what we believe to be important to us as individuals. Values reflect a person’s sense of right and wrong. Values can originate from many sources: parents, religion, schools, peers, people we admire, and culture. We learn values over time as children and later as adults. Values tend to influence attitudes and behavior. 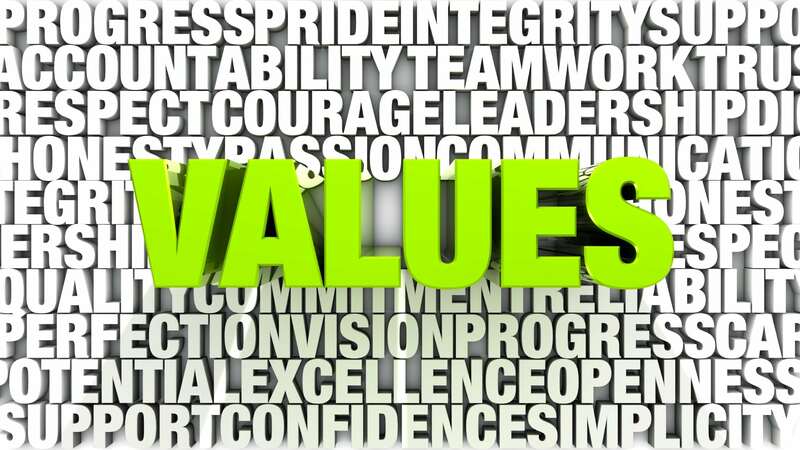 It is therefore imperative that a company’s values overlap significantly with their employees values. How aligned are these value sets? Note, there is nothing wrong with the above employee’s values. The employee’s values are simply different to the values of the team and the core values of the company. In high growth start-ups it is vital that decisions are taken quickly. The employee above will, in a high pressure situation, use her values as the baseline to make decisions and there is a strong chance that the decisions she takes will not match the decisions that would have been taken by the rest of the company because her values don’t match. If you understand the predominant values in your team you have a better chance of hiring individuals who match the job description and more importantly match the values of the company. If the hiring process is designed and handled correctly, the values of the new hire will match the founding team’s core values, which in turn are strengthened and enhanced as they add more team members. The best management teams realize and take action quickly if a new employee’s values do not align with the core values of the team. It is therefore critical to a successful hiring strategy that the founding team clearly understand what they value and how that translates into the company’s cultural DNA. Use the list below to do a simple analysis of the values in your founding team. Ask each team member to select ten of the following values/behaviours that most reflect who they are now. This is a great first step to understanding the individual values and combined values of the team. • Review each of the individual results as a team. • List the values, highlight the values that overlap. 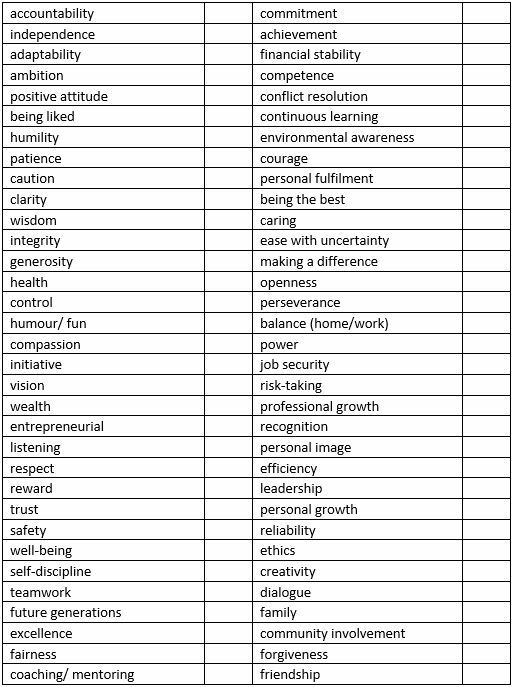 • Use these to define what your values are and what your values should be in future.